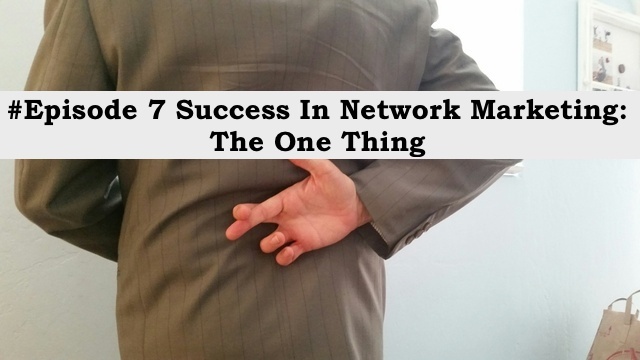 How To Be Successful In Network Marketing: The One Thing!! People try to make this far more complicated than what is, how to be successful in Network Marketing is not rocket science. Network Marketing success is going to be a result of how teachable a person is. In order for you to be mentored you first have to humble yourself and admit you don’t know what you’re doing. Unfortunately, many people find this a struggle and instead of being mentored they try to build their business by themselves and end up making a lot of mistakes. There is a reason why you are told to work with your Upline. Your Upline has probably gone through a lot more things than you have and can steer you away from certain disasters. Also, this is an earn while you learn, type of program, so until you get your own strength you need to hold onto the strength of your Upline. The problem with many people is they cannot get out of their own way and they let their ego affect their bank account. So they are always running around trying to find out how to be successful in network marketing when all they really need to do is humble themselves and being taught. Networking success is not just for a select few but it is for anybody who is willing to be directed. I am based in the UK and Network Marketing success in the UK is just the same as that Network Marketing success in any other part of the world. When people look at how to be successful many times they come to the conclusion that it is only possible in certain parts of the world. This is because they using that as an excuse not to do the things that they need to do. If you do that, the answer to “how to be successful in Network Marketing” will never elude you. That is the Network Marketing Truth! Hi my name is Chris I want to do something great and help give back. I have a lead that is very serious and I should get credit for my work I crack the code of how their bringing the drugs into the country a load comes to WI every mo on the 5. I can give you more details have someone scoop me up I’m hungry and need to figure out where I’m gonna go cause I got no money for 3 yrs now just room and board which would be fine but what about all the bulling damage to my credit the crime I’m dealing with in court cause of all this I have no coat I just left everything behind looking to get back to work after some rest I’m a good person I work hard ive just been pushed around enough so what do you think we can work this out I have great ideas to turn things around.